Is Dead Money Teasing the Next New Vegas DLC? Information about the next Fallout: New Vegas DLC release may already be in the wild thanks to some heavy teasing in the recently-released expansion Dead Money. It's safe to say that more Fallout: New Vegas expansions will be forthcoming and it looks like Bethesda may have already dropped some hints about what's on the way in Dead Money, the Xbox 360-exclusive-for-now DLC that came out on December 21. There are spoilers ahead, by the way, so consider yourself warned. First and foremost, there are apparently numerous references in Dead Money to an area known as "The Big Empty." 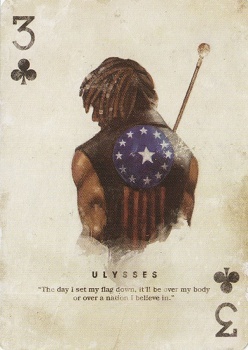 Christine, a Dead Money NPC, says she was rescued from The Big Empty by a courier who "wore the flag of the old world on his back," a description matching that of Ulysses, a character who appears on the three of Clubs playing card in the deck that came with the Collector's Edition of the game. Ulysses did not appear in the game, however; designer Chris Avellone revealed in a November interview with Lightspeed Magazine that the character was cut, but also suggested that he might someday make a return. "There's a character on one of the trading cards, Ulysses, who was supposed to be a companion," Avellone said. "Oddly enough, tearing him out of the game was almost as hard as putting him in because companion scripts touch almost everything (and he also was a complicated character in terms of some of the hooks into the storyline). Maybe he'll come back at some point. I miss him." Other evidence includes the existence of an "Eagle Flag Pole" in the Fallout weapons folder - Ulysses is carrying a large flagpole on the playing card - and conversations near the end of Dead Money that refer to a battle between two couriers in "the Divie," AKA the Grand Canyon. G4TV.com theorizes that a Ulysses-related storyline may run through the entirety of the New Vegas DLC until it eventually wraps up in that battle. It's a bit thin for that kind of long-term theorizing but as a line-up for the inevitable next DLC, The Big Empty sounds like it has promise. We'll keep you posted!